If you are struggling with a lawn that has turned brown within days and you are worried that you might have a fungus or insects, you might be wrong. The solution to your problem might be something much simpler – it could be improper mowing. There is truly an art to mowing your Gainesville lawn. When Mr. Tree and Lawn Service makes an assessment of a lawn for our clients lawn we ask a few questions. “When was the last time you mowed your lawn and how often do you mow your lawn?” Most people mow their lawn every 14-15 days and see an entire lawn turn brown a few days after they mow, if done incorrectly. The most common cause for lawns to turn brown or lose their color is because of improper mowing which can be caused by frequency of mowing, improper mowing height and dull mower blades. Mower blades must be sharp or instead of cutting you will be tearing your lawn. If your leaf blades have brown tips 2-3 days after you mow, your mower blades may need to be sharpened. Mow your lawn at least every seven days in the growing season. Never mow more than one-third of the grass leaf at a time. Change your mowing direction each time you mow. This ensures a more even cut and grass blades will be less likely to develop into a set pattern. Mowing height is extremely important. Know your grass type and mow at the correct height for the time of the year. 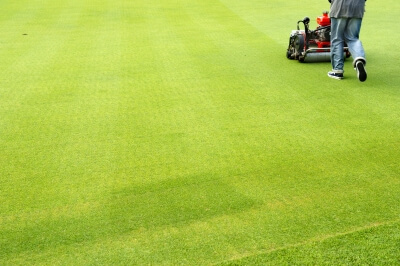 One of the easiest ways to ensure proper mowing technique is to use a professional lawn maintenance service such as Mr. Tree and Lawn Service. Call us at 352-682-4444 or use the convenient “Contact: feature on our website.